A problem I always have with my robots is they end up as a messy spaghetti monster with lots of wires leading to hidden places on the robot. When (purely hypothetically) the robot bumps into a wall some wires get loose and I have to figure out what was connected to what again. I should keep some documentation on my robot. I wanted to do this with Fritzing, a cool open-source program for drawing breadboard-prototypes and more. Lots of parts are already available in Fritzing, like an Arduino, a servo, chips, and so on. As the Dwengo board was not yet available as a Fritzing part, I created it myself. A Fritzing part is composed of SVG vector graphics: one for the breadboard layout, one for the schematic layout, one for the PCB layout, and one for the icon. These graphics can be created in InkScape. I never worked with InkScape before, so I had a hard time drawing the breadboard layout. The easiest way to create the layout was to take a photograph of the board, then import that in Inkscape, and draw over it. I reused the svg images from the existing Fritzing core parts to create the final layout. Because Fritzing has to know which part of the image is a connector where wires can start and end, one has to create connectors. This is done by creating rectangles with the names connectorXterminal and connectorXpin (where X is the connector number). In the schematic and PCB layout, the same connector have to exist with the same name. This way, Fritzing can keep the three layouts in sync, so if you create a prototype in the breadboard view, you immediately get a schematic view and a PCB view. In the parts editor, you can label all the connector pins and give them a description. You can also add and remove connectors if necessary. As you can see from the image, I created connector pins for the Dwengo connector on the left, and for the driver chip output on the right. The pin labels mention the PIC pin number and the corresponding Pinguino pin number (see https://kr3l.files.wordpress.com/2009/12/pinguino.gif). As you can see, this is a nice and easy way of creating a breadboard prototype of your project. 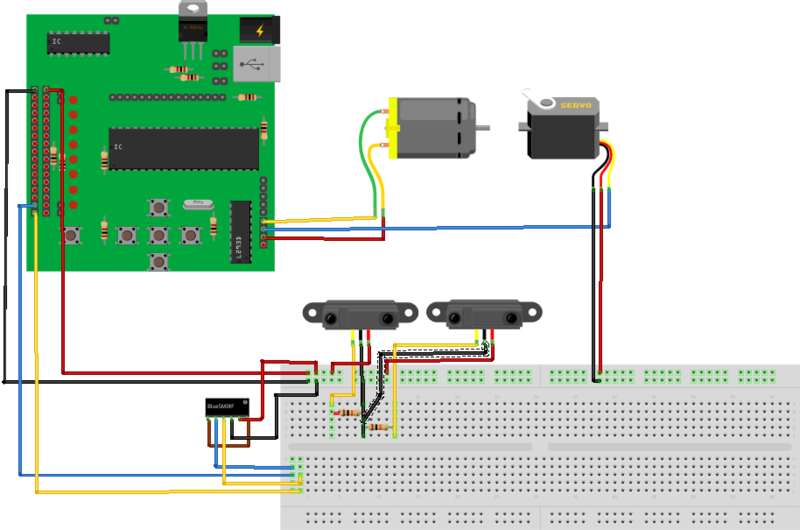 You can download this diagram from its Fritzing projects page. 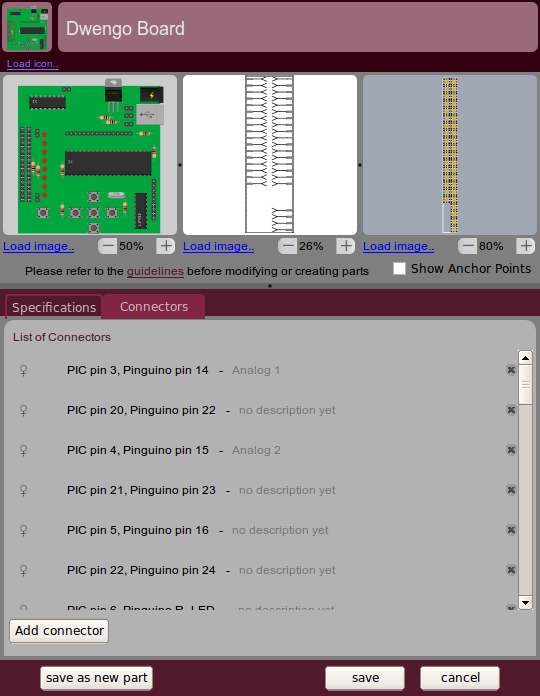 Fritzing features a lot more cool features, like automatically create a parts list, create an etchable PCB layout or Gerber files as a Pdf, …, which help you in sharing your project with others and in going from a prototype on a breadboard to a real product on a PCB! Entry filed under: Electronics, PIC18F. Tags: Dwengo, Electronics, fritzing, inkscape, Pinguino, rommelrubot. I have been using the Fritzing and I like it. After you build your project is there a way to test it on the computer screen, a blinking light that would blink for example! I tried the steps you mentioned in this blog. But unfortunately I could not replicate the results. I am able to associate the connectors with the elements in my SVG file using the parts editor. As a matter of fact, there are already crosses on the elements that are associated with the connectors. But the problem starts when I try to use the part in Breadboard View. Wires could not emanate out from its connectors. Nor will wires coming from the breadboard or from other circuits snap to its connectors. What seems to be the problem and how might I be able to solve it. I love this software but I need to create several custom parts. 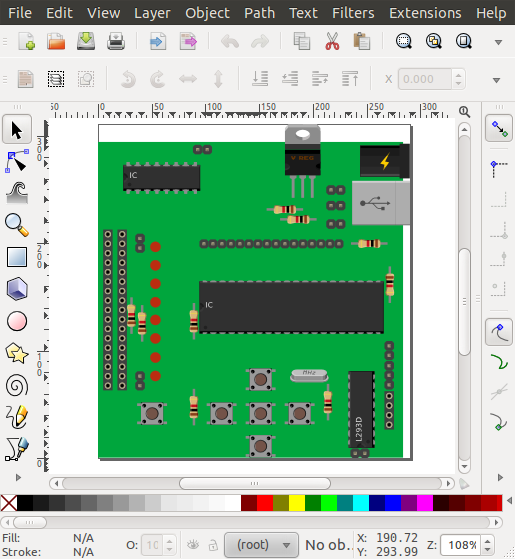 By the way I am using Inkscape 0.48 and Fritzing 0.8. All are running on Ubuntu 13.04. I also save my SVGs as “plain SVG” just like what other blogs have advised. Hope you could help me out. Thanks. I think using Fritzing is very useful for electronics education. I myself use some Dwengo boards but can not load the part to Fritzing. Perhaps the version you used is not compatible with the latest version of Fritzing?